The permanent exposition of the Valtice branch of the National Museum of Agriculture is dedicated to historic wine presses and implements used in wine-making. It documents the long development of wine-processing technologies. With respect to the area if occupies, it is one of the largest permanent exhibitions in the Museum of Viticulture, Gardening, and Landscape in Valtice. References to early wine presses in the Czech Lands date to the eleventh century, the first being a report about a vineyard with a press near the village of Dřísy, which Břetislav I, Duke of Bohemia, donated to the Chapter of Stará Boleslav. In Moravia, the existence of a wine press is attested in 1582 by its depiction in a serf land registry of Uherský Brod. These early presses were wooden and rarely any part of them survives. Combined wooden presses were, however, used even after the Second World War, which is why the museum has rich documentation pertaining to them. 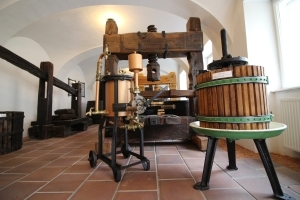 The collection of wine presses in the Valtice branch of the National Museum of Agriculture includes not only modern metal presses, still commonly used by small wine producers, but also some old wooden presses, the oldest dating to 1719. Dominant among these exhibits is a large press that is 2.45 meters tall, 3 meters wide, and with a bowl of 1.5 by 1.5 meters. Its weight is estimated at 2,000 kilograms. Visitors can also view a small wine press that utilised a heavy beam, a press from Moravian Wallachia with a stone bowl, and a home-made press from 1910 which represents a more modern generation of wine presses, where the most complicated part, i.e. the pressing screw and its head, were iron and factory-made. The exhibition also includes wine barrels with volumes indicated in the original measurement units and smaller implements used in wine harvest, such as hand mills, wooden hampers, and grape-picking knives. While the Valtice museum undergoes renovation work, only the Lednice-Valtice Cultural Landscape exhibition will be open. All other exhibitions will be closed. Thank you for your understanding.